From finders keepers to crafted flowers and plenty of games too, this is one flea market children are sure to love! This special tool was created in response to a special request received. (Open educ-poster-red) Print and display. Use it to help children identify the color. Sit in a circle with your group. Say, "At the flea market, I bought..." Name an item. The child sitting next you repeats the sentence and the item you named before adding one of his own. Placing items from your thematic bin in a basket as you go along will help younger children remember the items selected by the other children. (Open pretend money) Print several copies. Children can collect pretend money throughout the theme. Distribute bills for whatever reason (cooperation, kind gesture, sharing, etc.) 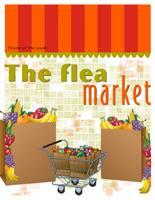 (Open poster-Flea market stands) Print and display in your various areas. 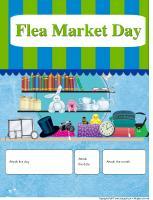 You can organize your own flea market day with your group and invite parents to attend. Create an area for each stand. 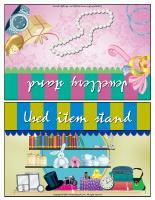 You can create a toy stand, another stand with snacks, and another one with children's crafts. 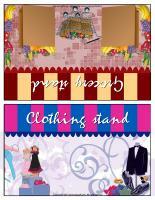 Children can purchase items at each stand using the pretend money they collect throughout the theme. They can take turns working at each stand. Be sure to explain that all "offers" are accepted at your flea market! Provide non-toxic makeup and mirrors. Children take turns painting their friends' face. In return, they receive pretend money. Deposit large plastic pitchers of lemonade and glasses on a table. Children take turns working at the lemonade stand to collect pretend money. Give each child a puzzle. Start a timer and have children complete their puzzle. Children shout out their name when they are done. When all the children have succeeded, give each participant pretend money. (Open game-garden) Print six copies. Laminate and glue the illustrations on the floor so that children can hop on identical illustrations (example from cabbage to cabbage). 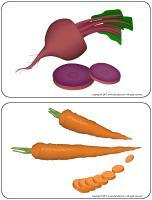 Name a vegetable and encourage children to hop on the corresponding illustrations. Name another vegetable. Children must change their route. Give pretend money to each participant. Place pretend money in a box. Wrap the box using several layers of adhesive tape. Sit in a circle with your group. Deposit oven mitts in the center of the circle. Children take turns rolling the die. When a child rolls a "1", he must put the oven mitts on and begin unwrapping the box. The other children continue rolling the die. When another child rolls a "1", it is his turn to put the oven mitts on and unwrap the box. The game ends when a child reaches the pretend money in the box. Give pretend money to each participant. Set a cash register on a table. Children can take turns working at the toy stand and earning pretend money. Give the other children a bag with handles. Invite them to walk around the flea market (the daycare) to select the items they wish to purchase (daycare toys). If you prefer, you could give them specific items to find. When they are done, they must pay for their purchases with their pretend money. (Open price list) Print and laminate. Set a cash register on a table. Children take turns being the cashier. Give the other children a bag with handles. Invite them to walk around the daycare to select plastic food items. When they are done, they must pay for the items with their pretend money. Deposit a specific number of clothing items in front of each child. Set a timer. Children must race to put all the clothing items on before the timer goes off. Give pretend money to each participant. Provide paper, paintbrushes, and poster paint. Have children create masterpieces which can later be sold. Give pretend money to each participant. Organize relay races. Deposit baskets at each end of the daycare. With a partner, children must fill their baskets with vegetables as quickly as possible. Give pretend money to each child. Deposit four to six different objects on a table. Ask children to examine them closely. Cover the objects with a blanket and remove one object. Remove the blanket and ask children to identify the missing object. Give pretend money to each participant. Print one of the bingo games available in the educatall club. Print and laminate the cards. Play bingo with your group. Children can take turns calling out the cards. Give them pretend money in return. 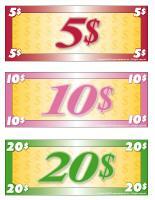 Reward the winner with pretend money too or give pretend money to each participant. Provide a large quantity of books and invite children to search for specific items. Children can take turns "selling" the books to collect extra pretend money. Begin singing a song then point to a child. The child must continue singing or humming the song. If he succeeds, reward him with a small amount of pretend money. Lay out several information flyers you have collected. Children can take turns working at the stand and answering their friends' questions to collect pretend money. Invite children to look at picture books for inspiration before drawing their favourite flower. If you prefer, provide tissue paper, construction paper, and items which can be used to represent stems such as pipe cleaners, drinking straws, paper towel rolls, etc. Let children create beautiful flowers. When they are done, children can take turns working at the flower stand and selling their flowers to collect pretend money. 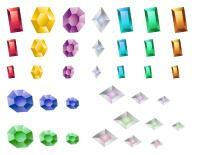 (Open craft-jewel models) Print several copies and help children cut out the shapes. Set up a table with scissors, glue, and glitter. Children cut a strip of construction paper (2 cm wide) and glue jewels on it. Children can make several bracelets or necklaces. When they are done, they can sell their creations in exchange for pretend money. With parents' help, organize a real flea market stand with toys children no longer use. The goal is not for children to purchase toys. However, they can exchange toys among themselves. To end the theme, prepare an impressive treat stand. 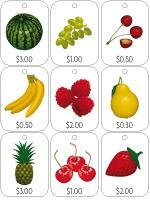 Invite children to choose a treat in exchange for any pretend money they have left.